Ukraine is the second largest country in Europe after Russia. It occupies an area of 603,700 square kilometers and is situated entirely in Eastern Europe. It shares borders with Russia, Belarus, Poland, Slovakia, Hungary, Romania and Moldova. To the south it has a wide outlet to the Black and Azov Seas. There is a number of evidences to show that the lands of what is today Ukraine have been populated since ancient times. The oldest traces of human presence in the area date back to approximately 45,000 years BC. After the fourth millennium BC these lands were inhabited by various nomadic tribes. The best time to visit Ukraine are the months of June, July and August, which offer perfect weather conditions. Moreover, this time of year offers a variety of festivals and other interesting events to be visited. Like most European countries, Ukraine is an easily accessible tourist destination. The country has several international airports that handle flights to countries around the world. The most important in this respect are the capital Kiev, Kharkov, Odessa, Lviv, Simferopol and others. Another easy and cheap way to get to Ukraine is by bus from almost every European country. Other alternatives are to travel to Ukraine by train from Russia, Poland, Romania, Belarus, Moldova and other countries in Eastern Europe or by ferry from Istanbul or Varna to Odessa. 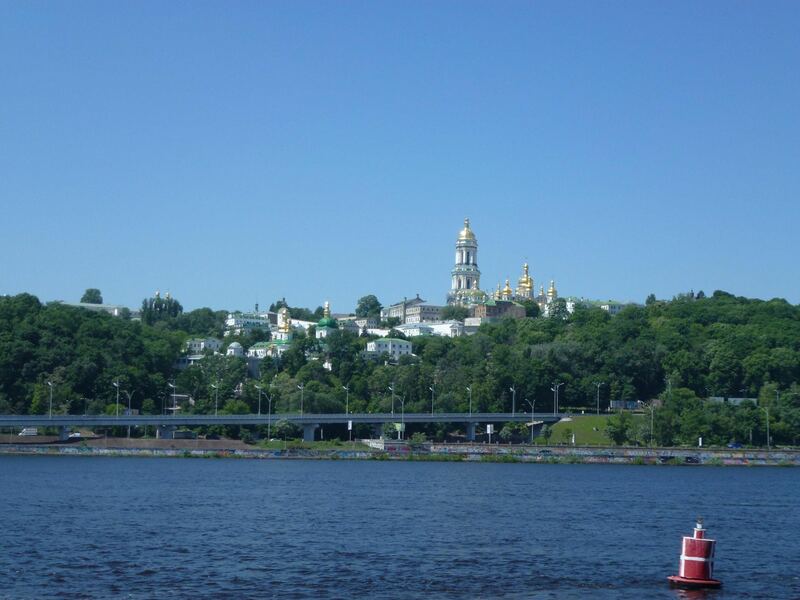 The main attractions of Ukraine are the capital Kiev with its beautiful architecture, majestic churches, historical monuments, large squares and, of course, the wide river Dnieper, which slowly and stately flows through the city. Visit the Crimean Peninsula and the Ukrainian Black Sea Coast. The place is known as the Ukrainian Riviera. It is known for its Mediterranean landscapes, picturesque villages and beautiful coastline as well as one of the most spectacular caves in the country – the famous Marmurova Pechera (Marmurova Cave). Also, on the coast of Crimea is situated the popular resort town of Yalta. Do not miss to visit the largest coastal city of Ukraine, Odessa, famous for its beautiful harbor. Among the most interesting places to visit in the country are the Danube Delta, Lake Sinevir in the eponymous national park as well as the scenic Dnistrovskyi Canyon. While in Ukraine do not forget to try the traditional local dish “borsch”. It’s a kind of vegetable soup, which may contains meat by choice. If you want to try a real strong alcoholic drink then you might like traditional beverages such as vodka and medovukha (made from honey). Try also some homemade Ukrainian compote – a kind of traditional drink of sugar, pieces of boiled fruits (peaches, pears, berries, pitted cherries, etc.) and water. The national cuisine of Ukraine is very similar to these of Russia and other countries in Eastern Europe. The most widely used ingredients are local vegetables such as cabbage, potatoes, onions, carrots, celery and many others. Meat consumption is significantly higher compared with the countries of Southern Europe. Lamb, beef and especially pork often present in the daily diet of many people. Bacon with more fat, pickles or pickled fish are some of the most popular appetizers in the country. Almost the entire territory of Ukraine has a temperate continental climate. Since the country is located in the middle of a climatic corridor, the difference between summer and winter temperatures is significant, and the change in weather – rapid and dramatic. Summers are generally pleasantly warm with average daytime temperatures in July usually about 26 – 27°C, but periods of heat and temperatures above 39°C are not excluded. Winters are cold with temperatures usually in the range between (-6) and 2°C. However, under the conditions of strong northern winds during the winter months are possible extremely cold temperatures below (-30)°C. The precipitations that fall over the country are generally moderate throughout the year, slightly more abundant in early summer. The period of snowfall normally starts in November and ends in March. The southern coast of the Crimean Peninsula is quite different from the rest of the country. It falls within the subtropical climate zone and enjoys a warmer climate. High mountain ranges protect the coast of Crimea from cold northerly winds during the winter months, and therefore even in January the average daytime temperatures remain relatively high – about 7°C. Summers are very hot with temperatures around 28 – 29°C but sometimes reach up to about 40°C. Similar to the Mediterranean, summer is the driest period, and the most abundant rain falls in late autumn and early winter. Like any other country, there are places you should avoid in the largest cities of Ukraine. This is especially true for the capital Kiev. Although cute, they sometimes become quite aggressive and can bite you. Be especially careful if you are planning to visit Chernobyl – travel only as part of a group and follow all safety rules! Before to travel to Ukraine is good to know that the health system in the country is not very well developed, so if you have any health problems is advisable to take care about your health in advance. Ukraine is located in the southwestern parts of the vast East European Plain, and therefore it has an almost completely flat terrain. The only exceptions are the Carpathian and Crimean Mountains, which together cover only one-twentieth part of the total area of the country. The Carpathian Mountains are located in the extreme western areas. This is where the highest point of Ukraine (Hoverla peak, 2,061 meters high) is. The Crimean Mounts are smaller and relatively lower. They are situated in the southern coastal areas of the peninsula of Crimea. The majority of the territory of Ukraine is occupied by vast steppes. Today, most of these planes are occupied by farmland. To the north the typical grassy vegetation gradually gives way to woodlands dominated by deciduous trees such as poplar and birch. Some of the largest European rivers pass through the territory of Ukraine. The most impressive are the Dnieper and Dniester Rivers, which flow their waters into the Black Sea. The bigger one, the beautiful Dnieper River, passes through the city of Kiev and imparts to the view a typical European romantic appearance. The seashore of Ukraine is diverse. The coastline to the west is slightly indented, with tens of kilometers long deserted golden sandy beaches. In the central and eastern parts the coast is diversified by many bays and peninsulas, including the large estuary of the Dnieper River. The southern coast of the Crimean peninsula is popular among tourists. It has a typical Mediterranean spirit and offers beautiful sandy and rocky beaches and steep coastal slopes covered with Mediterranean vegetation. To the east, along the coast of the shallow Sea of Azov, there is a large number of long, lonely and secluded sandy beaches. The sea surface is usually quite calm. The weather, however, can change very quickly turning this calm and transparent sea into a veritable roaring water hell. As a typical country occupied by steppe, the fauna of Ukraine can boast a truly huge variety of rodents. Rabbits, field mice, shrews, voles, moles and hundreds of other lesser-known small mammals live among the endless grasslands. With such a large variety of small animals, it is not surprising that the country is home to an impressive variety of species of birds of prey. Over Ukraine’s grasslands circle hawks, falcons, eagles and many others. There are also various species of nocturnal predatory birds such as different kinds of owls. Ukraine’s woodlands are inhabited by wild boars, foxes, wolves, lynx and deer. In some parts of southwestern Ukraine are also found wild cats, jackals and even a small number of brown bears. In marshy areas near rivers you will find various species of waterfowl, storks and herons. Peoples such as the famous Yamna culture, Cimmerians, Scythians, Sarmatians, Greeks, Huns and others left deep traces in the culture of Ukraine. The numerous Slavic tribes, however, undoubtedly had the leading role in the region. They become an integral part not only of the population of present-day Ukraine but in most countries in Eastern Europe. During the Middle Ages most of the lands of modern Ukraine were within the borders of the so-called Kievan Rus (or Kievan Russia). In 1922, Ukraine became part of the Soviet Union, and the country gained independence in 1991, after the collapse of the USSR. The population of Ukraine is 46,710,816 people. Cities such as Kiev, Kharkov, Dnepropetrovsk, Odessa and Donetsk have a population of over 1 million inhabitants. Although almost 77,8% of the population are Ukrainians, Ukraine is considered to be a multinational country, because there live more than a hundred other nationalities. The most numerous of them are Russians (approximately one out of every 6 people). The official religion in Ukraine is Orthodox Christianity, and the Christian faith in the country has more than a thousand years of history. Ukraine is a developing country, and its average standard of living is still quite low compared to all the countries in Western and most countries in Eastern Europe. However, Ukraine has a very solid base for development. After the collapse of the USSR very important for the Soviet economy enterprises and factories remained within the borders of independent Ukraine. For this reason, industry is today the leading sector of the economy. Agriculture, however, is not less important. Ukraine is often called “the breadbasket of Europe”, as it is known for its large fields sown with high-quality cereals. The country is among the largest producers of fruits and vegetables in the world. The service sector, especially tourism and financial services, enjoys a rapidly growing significance.